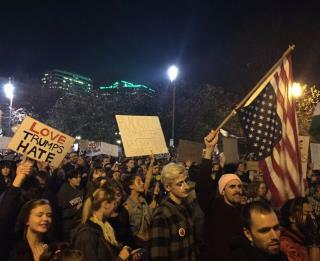 (Newser) – Portland, Ore., saw some of the fiercest protests against Donald Trump being elected—but more than a third of those arrested didn't bother to vote against him, according to KGW, which compared a list of 112 people arrested to state voter logs. At least 39 of those arrested were registered to vote in Oregon but did not return a ballot. Another 35 of those arrested were not registered to vote in the state, while 34 were registered to vote in the state and did so. Another four were under 18 and ineligible to vote. Wanna bet the numbers are far higher than being reported? kids these day feel like they are entitled to everything and the only way to get it is to go democratic...the world is not free nor should it be go out and earn like the the rest of the hard working American. And stop your bitching. You think if "Crooked" Hillary won that republican would be protesting like this, absolutely not. You haven't seen us protesting the past 8 years when we have all the cause it the world.